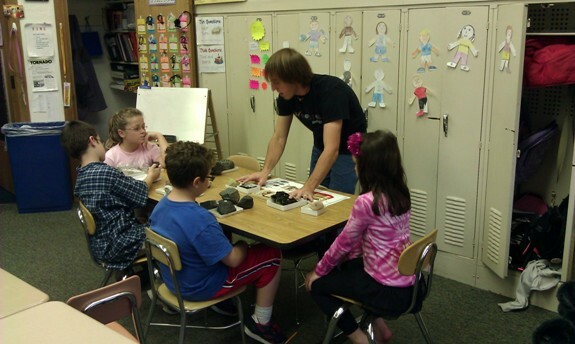 On Friday afternoon, a group of Wooster geologists participated in an educational outreach program at Wayne Elementary. Marge Forbush, an educator at Wayne always asks the department to come to her classroom twice a year. In the fall, we spend an afternoon talking to the students about volcanoes and earthquakes, while in the spring, we discuss fossils. This afternoon was particularly exciting. After a short introduction on volcanoes and earthquakes, the students then moved between 4 stations that we set up in the classroom. Geology majors at the college were each in charge of a station, fielding rapid-fire questions from the students. Lauren Vargo (’13) handled “Plate Tectonics”, while Nick Fedorchuk (’12) taught “Earthquakes”. Cameron Matesich (’14) showed the students “Intrusive Igneous Rocks”, and Sarah Appleton (’12) took charge of “Extrusive Igneous Rocks”. 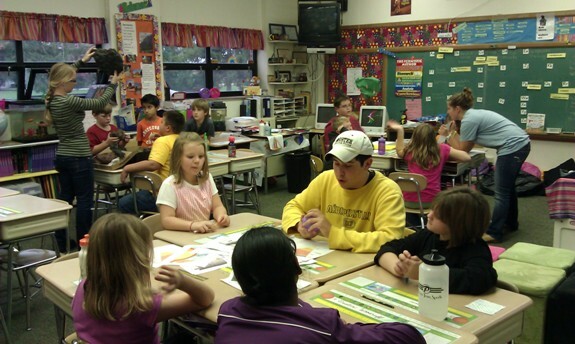 The Wayne Elementary students were excited to interact with department majors, and our majors did a fantastic job of teaching and mentoring. The picture above shows everyone hard at work at their stations. Sarah (left in green), Nick (center in yellow), and Lauren (right in blue) had the attention of their students throughout the afternoon. Cameron, above, is busy introducing the students to minerals and igneous rocks, which they were able to see close-up with the use of hand lenses.